Hardball's Chris Matthews on Monday spewed hatred for Newt Gingrich, excoriating him as voicing "deadly" contempt for Barack Obama. Matthews trashed, "He's a political killer, a gun for hire." Using demonic references, Matthews bombarded, "[Republicans are] about to begin the nomination for President of a figure who represents the Mephistopheles of what they preach. He is nasty, brutal, ready to fight and kill politically." Does trying to win a presidential election really equal supporting the "false god of hatred"? 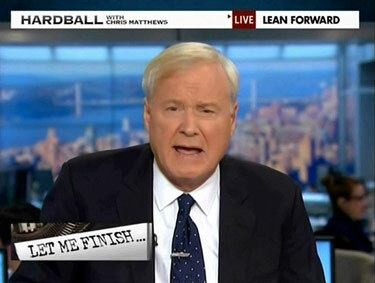 CHRIS MATTHEWS: Let me finish tonight with this. The Republican Party is about to seal a Faustian deal with the devil. Every observer from left to farthest right knows what's going on here. The Republicans, led by the angriest among them, are about to give away their partisan souls for one all-consuming political purpose, the destruction of Barack Obama. They're about to begin the nomination for President of a figure who represents the Mephistopheles of what they preach. He is nasty, brutal, ready to fight and kill politically, a man of no discernible commitments or values, who has nothing to offer but a sharp-as-hell intellect and a wicked rapier of words. For the right price and a presidential nomination is his [sic], Newt is ready to jump on a dime and hit any opponent where he shows weakness. Why are they on the verge of enlisting in the army of Newt? Because he voices in cold, nasty, deadly tones the words of their contempt, because he's an opportunist ready to seek any route to his opponent's heart and thereby kill it. He's a political killer, a gun for hire. But he offers a prize so precious, he cannot be resisted. This. This is the Faustian deal at hand: Newt Gingrich's promise of a vision of which they on the right have set their hearts, the few minutes of national television in which the President and his wife stand before them in defeat. That's why they're offering up their partisan souls, why they're ready to bow down before this false god of hatred. They will give their souls to Newt, their compact with the devil to get what they most want: Pain on their enemy. They want it more than yet another tax cut, more than another wild, unwarranted war, more than love or freedom or joy. They want the President's head. And they've cut a deal with Mephistopheles to get it. What they're doing isn't good. They know it as well as we know it. Deep down, it is wrong to run someone who is so different from what you value. They know it's wrong and they're doing it still. They're willing to give up all the values and hopes and claims to goodness they've ever professed. They're willing to strike this deal with the devil because they want to hurt Obama, because the most enticing prospect of this entire campaign is the chance to bring down this President. And in the prospect and act of doing so, they imagine how damn good it will feel.